Sensors play important roles in automatic systems; smart systems have to be equipped with smart sensors. PolyBot, a modular self-reconfigurable robot developed at the Palo Alto Research Center, is designed with a rich set of sensors in each of its 5 cm-cubed modules. These include infra-red (IR), accelerometers, potentiometers, force, and touch sensors. These sensors are used: to determine the current state of the system and its environment; to obtain the six degree-of-freedom offset between two docking plates for automatic reconfiguration; to select the right gait for locomotion; and to trigger different behavior modes in response to different terrain conditions. Sensor computations are computational methods that, given raw sensor data, extract or deduce the state information about the system. 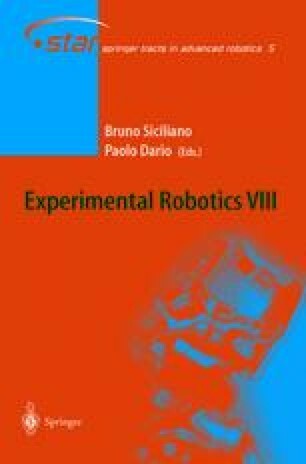 This paper discusses two types of sensor computation, forward computation and inverse computation and focuses on two interesting sensor computations in PolyBot: IR 6 DOF ranging and accelerometer 2 DOF orientation.